Abdul Karim (fifth right) seen holding fliers for the event together with Lee (centre), Henry (fourth right), Miro (third right), Ik Pahon (second right) and other officials after the press conference yesterday. KUCHING: The state government will organise a first-of-its-kind multi-sport adventure event, called the ‘Sarawak Adventure Challenge: The Lost Mines’, in Bau this year. Tourism, Arts, Culture, Youth and Sports Minister Datuk Abdul Karim Rahman Hamzah said the event will be staged on Oct 14 and will offer cash prizes of over RM33,000. “Sarawak is renowned for its rainforests, rivers and scenery, and the race route will take competitors through some spectacular landscape. Over the course of the event, competitors will cover more than 40 kilometres of mountain biking, more than 14 kilometres of trail-running, as well as a caving section,” he said during a press conference yesterday. Set as a one-day team event, teams of two will be required to complete all stages which will see them navigate single track trails, as well as old mining trails through jungle, streams, local roads, villages and plantations. There will be two entry categories, namely the Men’s Open Team and a Mixed Open Team, with RM6,000 going to the winners of each category. Cash prizes will also be awarded to the top-14 placing in each category. 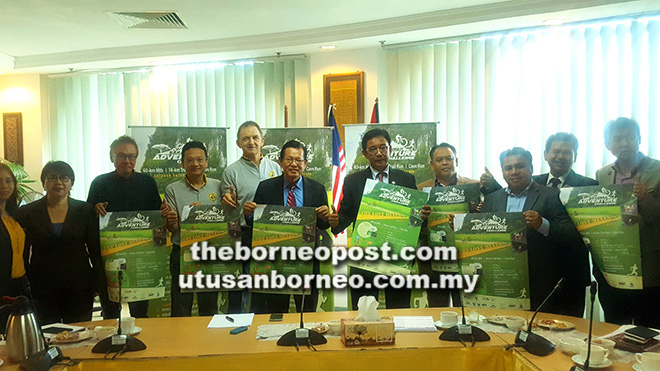 According to Abdul Karim, the inaugural event aims to deliver on Sarawak Tourism’s marketing tagline ‘Where Adventure Lives’, and gives participants a chance to live the adventure. The international multi-sport adventure event will include a combination of mountain biking, trail-running, as well as a cave run – evoking images of Indiana Jones. ‘The Lost Mines’ theme is a reference to the area’s colourful mining history and the fact that the race will incorporate some of these features. “This international event has already attracted the attention of a number of top-ranked regional teams and approximately 150 participants are expected for this year. “The event is supported by the state government through the Ministry of Tourism, Arts, Culture, Youth & Sports; the Sarawak Tourism Board; the state constituencies of Tasik Biru (N2) and Serembu (N18); the Bau District Council; and endorsed by Tourism Malaysia,” commented Abdul Karim. Also present during the press conference were Assistant Minister of Tourism, Arts and Culture Datuk Lee Kim Shin; Ministry of Tourism, Arts, Culture, Youth and Sport permanent secretary Datu Ik Pahon Joyik; Tasik Biru assemblyman Dato Henry Harry Jinep; Serembu assemblyman Miro Simuh and other officials. Registration is now open at www.sarawakchallenge.com, with the early bird promotion ending on July 31. For more information regarding the challenge, please call JC Chua (012-8979068).